Intriguing, but I don’t have an IPhone and really don’t need any more electronic gadgets while sailing. I go sailing to get away from all that stuff and get down to reality. Navimatics with ActiveCaptain is much better. I have the EarthNC product (and MarinaLife - same thing). I wish I could get my money back for EarthNC. You should do a comparison review. You'll see for yourself. Thanks for the comment ActiveCaptain employee! 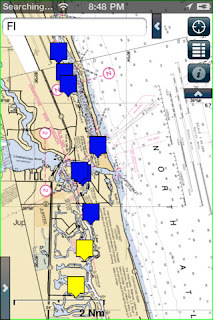 We have free EarthNC charts embedded on several pages of Firstboat.com. While not a mobile app, we have had nothing but positive feedback on EarthNC and the content they provide.